The Refuge Vow: A Sourcebook is a compilation of commentaries and traditional text excerpts on the Buddhist Refuge Vow by various teachers including Chögyam Trungpa, Sakyong Mipham, Tsoknyi Rinpoche and Thrangu Rinpoche, among others. 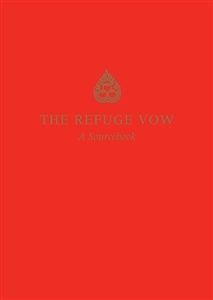 A valuable resource for both those preparing to take the vow, and for teachers of Buddhism. 65 pp. softcover 6" x 8 1/4 "